Christmas returns to the USS Peleliu. Navy Petty Officer Nika Maier flies on a 180-ton hovercraft for a living. Nothing prepared US Ranger Clint Barstowe for the 110-pound dynamo who scoffs when he wears a Santa hat into battle. Nika’s past lies safely buried in the bottom of her duffle, right down there with her interest in a lasting relationship. Clint swore off serious women after his first marriage, but his feet are swept out from under him by the 110-pound sailor who flies a 180-ton hovercraft. When a mission throws them together and they are cast onto a beach like driftwood in a storm, none of their training prepares them for what happens to their careful plans. 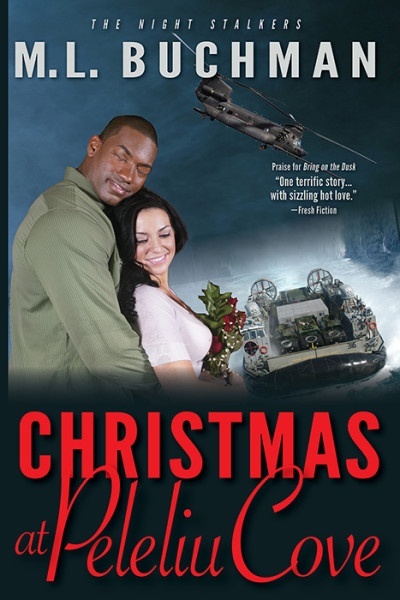 When her past and his present collide, they must fight the battle together to win a merry Christmas at Peleliu Cove. Other Books in "The Night Stalkers and the Navy"